More than just a streetwear brand of today's 'hypebeast' generation, Huf was created in the gritty streets of NYC during the early 2000s, by pro skater Keith Hufnagel. 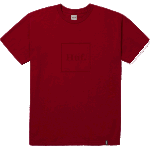 Known for its sleek and cutting edge design in skate shoes and garments, Huf is well worth the hype. Fun fact: In addition to being an abbreviation of Hufnagel, the name Huf refers to "huff" meaning to puff or blow. This gives a pretty sound explanation for those infamous Huf weed-print socks!